Enamel Dolphin Jewelry in Cloisonne in 22k and Sterling Silver with Blue Topaz Paradise – beautiful cloisonne jewelry! 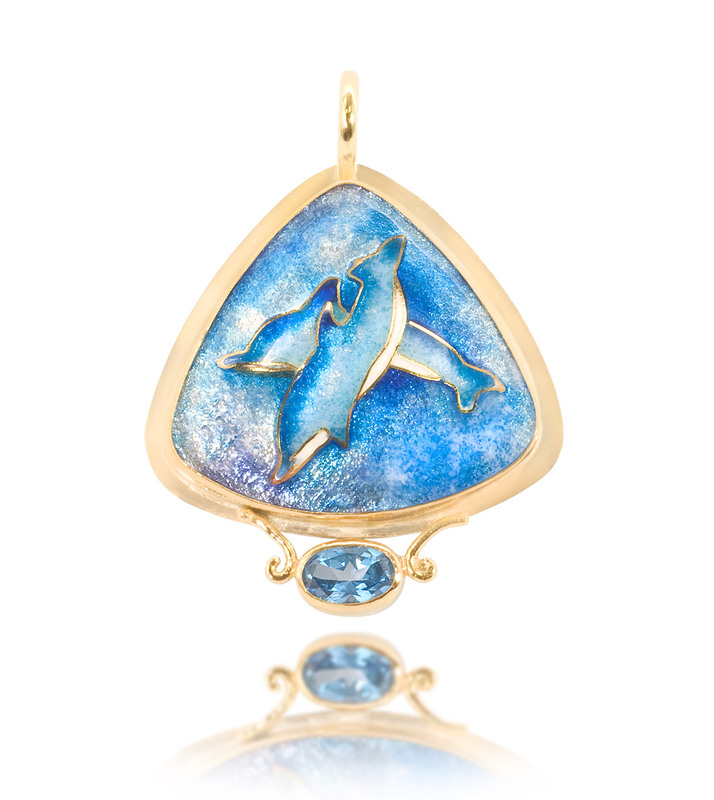 Dolphin is a cloisonne jewelry piece created by Patsy Croft. It belongs to Ocean collection of amazing enamel jewelry with unique jewelry designs. I grew up with images of dolphins everywhere. My mother adored dolphins and she was a strong fisher women. So, it was no surprise when I started drawing dolphins as a pen and ink artist. When the direction of my artwork transformed into cloisonné jewelry, it was natural for me to create a piece celebrating dolphins. Have you been with individuals whom have never seen a dolphin? They get so excited to have them play in the wake of the boat. Reaching out and trying to touch them. Even as many times in my life that I have seen them, I still stop my boat and admire their beauty and grace. Determined to bring awareness to the importance of our waters, not just for us, but for the dolphins, I have created this unique jewelry design, my own drawing, making this one of a kind gold jewelry pendant. Applying the 24k gold wire for the lines of my drawing, on to the fine silver, was the initial step of cloisonné jewelry. Painstakingly adding the fine grains of enamel, no more than three grains at a time, was the process I liken to painting on a canvas. I add depth and contrast, bring it alive and make it vibrant with these enamel colors. The beautiful blues of the ocean are what I see on my dives in Bonaire. The varying hues in the water are just how the sun plays on the surface of the dolphin as they swim past me. They are a precious and integral part of our beautiful world. I feel it’s of the utmost importance for us to take care of our waters, for our generation and for the future of our children. Wearing this gold enamel jewelry helps to bring the awareness to you and to all who see you wearing it.